Deep divisions within the opposition came to the fore over the Christmas break, fueled by a polemical interview with opposition leader Henrique Capriles Radonski published on December 23. Capriles hinted that the priority for the new opposition dominated National Assembly should be the “stabilization of the economy,” instead of pushing for a quick removal of president Maduro from his post via a recall referendum. We have to look into the (national) budget, income, we need to stop the giving away (regaladera) of oil, we need to look into our credit conditions…We need to stabilize the patient before calling in a new doctor. Capriles thus criticized a fast-track agenda by the new National Assembly in favor of a moderate program focused on the economy. 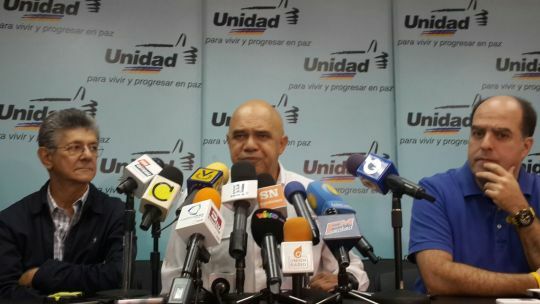 He also directly stated his criticisms against La Salida faction within the opposition. The La Salida protests in 2014, associated with jailed opposition leader Leopoldo López, lead to street violence and heavy handed government repression. La Salida should be included among the greatest national failures, like the paro (national strike in 2002-2003). It gave the government a narrative for more than a year, and still does. If we had continued down that path we would not have won the December 6 elections…We have now a policy that works and we have to continue strengthening it. There is no space here for a second edition of La Salida. Reactions were swift. Leaders from Leopoldo Lopez’s party Voluntad Popular were most critical of Capriles: Carlos Vecchio for example wrote on Twitter (@carlosvecchio) “Is there a worse historical mistake than winning an election and allowing that victory to be stolen? Is there anything worse than that Capriles?” Vecchio was referring to the common belief among opposition radicals that Capriles won the 2013 presidential elections, but allowed the government to steal the elections. Ramos Allup’s intervention amounted to an effort to triangulate around his main rival for the position of National Assembly president, Julio Borges, by siding with Voluntad Popular and other parties fearful of Primero Justicia’s predominance. The result is that despite a previous agreement among opposition forces to alternate the presidency among the parties that received the most votes, the presidency of the AN will now be determined by secret ballot on Sunday January 3. Tensions within the opposition were temporarily over the past week by the Tribunal Supremo de Justicia (TSJ) decision that it would admit the legal contestations against ten elected opposition deputies and one PSUV deputy, including three deputies from Amazon state that will not be able to take their seat while the contestation runs its course. The decision by the court leaves the opposition short of the 112 threshold of a supermajority in the National Assembly and has forced opposition leaders to respond in unison against this last minute threat to their supermajority. The TSJ’s admission of contestations of opposition deputies would in theory strengthen the hand of the more radical factions within the opposition. However, the MUD is making every effort to maintain the appearance of unity. When Torrealba announced in a press conference “the pacific path chosen by Venezuelans to solve this severe political, economic, and social crisis suffered by the country is in danger,” he was flanked by Ramos Allup and Borges.